There’s this very vague report going around about new 42 Mbps smartphones coming to T-Mobile in the second half of this year, made by HTC, LG and Samsung. I’m just going to come right out and say it, “Well, duh!” This should come as no surprise, it’s about as solid of a story as that great Samsung phone from yesterday (which is actually quite solid). With a network that supports 42 Mbps, T-Mobile would be a fool to NOT have phones that can utilize it. 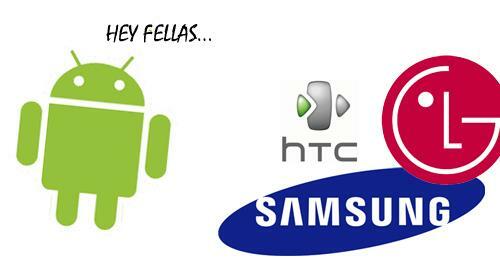 Given T-Mobile’s relationship with these manufacturers this will of course happen. To tease you a bit more, though, you may want to keep your eyes out for news surrounding the HTC “Bresson” and “G-Infinity,” Samsung Hercules and “Dumont,” and the LG Maxx or “Gelato.” You know, something to think about. My new sensation still smell new. I don’t know where top go any more from tmobile. I’d rather have a phone that can at least last 12 hours on a charge instead of a phone that would require a car battery just to make it through lunch connected at those speeds. Sorry I hit a nerve. I am more than happy with my Sensation and don’t see the point of increasing the speed to the point you can’t take the phone off the charger. Seems counter-productive. Battery tech needs to catch up first, then they should increase the speed. Yes but until they develop a phone and put into service you have no idea if it has good battery life. So I say develop away. If it works, buy it, if not, don’t. Just don’t be the first one to purchase and read the reviews for the first month. I say LG can burn and die I will never buy an LG anything again. After the g2x I learned my lesson!! I know these speeds are theoretical so I won’t get my hopes up. Especially since most ppl have broadband at home that caps at about 20 mbps so expecting 42 just doesn’t make sense to me. i’m thinking the samsung dumont is t-mobile’s sgs2. with a potential release date in october, it certainly makes sense and is a hell of a lot more substantial than everything else i have seen on a t-mo sgs2. LG? Cool, a 42Mbps phone that reboots randomly with battery pulls! They can call it: The The T-Mobile Reboot made by LG. I am sure it will sell well, lol! lol…. I don’t think the issue is specific to LG. I believe the Tegra 2 has some issues when paired with Android 2.2. It’s something with the sleep state of that system. Heck, even my Iconia A500 had issues with sleep/reboots/waking up in Android 3.0. Now it is perfecto running stock 3.1. I had a Viewsonic GTablet and it had issues like this as well. However, Viewsonic seemed to fix the issues completely in just a few months. If LG is to be blamed right now, it’s for the fact that they released the phones and didn’t offer any quick solutions. They must have known about the problems, though perhaps they didn’t run any beta tests on the phone previously. I suspect however that it will be a great phone after the Gingerbread update. oh so you mean people actually want PHONES that can take advantage of this network and not just modem devices? lol duh says i to TMO. I am very excited about the Hercules and HOPE it ships with 42Mbps support. I’m moving on from HTC since they are stuck on selling phones with 1GB and 512MB user storage. I love my MT4G but it’s time to move on. If it’s not the Hercules I guess I’ll have to wait (impatiently) for whatever Samsung has coming after that. wait for the Nexus Prime (nexus 3). With any other phone between now and then, you’re going to sit around waiting for Ice Cream for months and months. Plus you’re going to get that vanilla flavor, which is worth its weight in gold. Tell me again what I do with my HSPA+ phone next year? continue using it? wow people are dumb here. you act like your phones die when new ones come out. they don’t. I’m not sure what the point of a 42mbps phone would be. I have a mt4g and live in an area with good hspa+ coverage and my theoretical limit should be 14.4mbps I think but the fastest I have seen is about 9.25mbps. NYC won’t have 42Mbps HSPA+ until block A AWS is active. maybe not getting a sensation was a good idea now! soon as i heard about Nexus Prime i returned the Sensation.can’t wait till the holiday. To bad that all of tmobiles 4g phones are going to be able available to use the 42mbps with is just faster 3g and I have a sensation 4g its amazing but my upgrade is a week from now Plus all tmobile really need to do is update there 2g to 3g speeds and there 3g(4g?) To get 4g speeds and tmobile would be the best company on the planet but that’s if they don’t sell out first like little mo’s though. i have no idea what you’re trying to say but i’ll take hspa+/faux G over battery draining 4g lte anyday. 5-7Mbps is good enough for mobile. i’m not downloading gigs and gigs of stuff on my phone. So is TMobile getting a version of the Galaxy S2 that doesn’t have a 4.5″ screen? Will it get a 4.3″ version? Anyone seen any rumored specs on the G-Infinity? hopefully one of those device is equipped with NVIDIA.